Of course what first intruiged us about Zevia soda was the fact that the Zevia sodas have no calories and are made with natural sweetener from the stevia plant. According to the Zevia website, the stevia plant is a sunflower-like plant that can be three-hundred times sweeter than table sugar, yet has no effect on blood sugar levels. When we received our sodas, I wondered how the taste would compare to other diet sodas. After my first taste, I knew that this soda was different and better! The flavor of the stevia sweetener is a lot less intrusive than regular diet sweeteners. My husband quickly drank almost all of the sodas (clearly he was a fan!) but I got a taste of the Orange Zevia soda and the Black Cherry Zevia soda. They were great! The orange was my favorite, which was surprising, since that is not normally a soda flavor I enjoy. To me, that meant that Zevia is doing great! 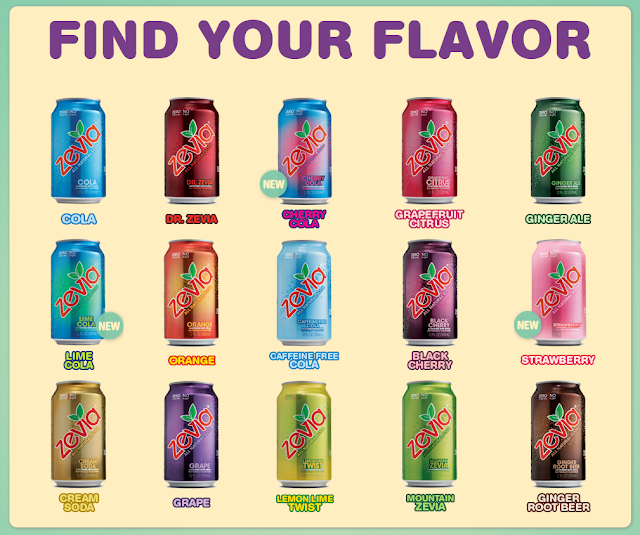 We enjoyed our Zevia sodas so much that we didn't even get any pictures of the sodas! They were gone before we knew it. So these great pictures are from the Zevia website. I love how they show off all of their great flavors! Some of their sodas do contain caffeine, but most do not. Another of the things that we love, in addition to the great taste, is that Zevia contains no artificial sweeteners, no artificial colors or dyes, and no GMOs. Thank goodness for a truly natural soda! Would you like to try Zevia soda as well? Why We Love Green has a giveaway for Zevia soda going on right now through 10/31/12.